A prosecutor notes that while indictments against corporations and their managers for environmental and safety crimes are rare, “those who poison our environment will be prosecuted when the evidence justifies it.” Now two managers face jail time in connection with one of the worst storms in U.S. history. A grand jury has indicted Arkema North America, its CEO Richard Rowe and plant manager Leslie Comardelle, placing responsibility on them for the release of a toxic cloud over the Crosby, TX, community during Hurricane Harvey. The indictment charges they all had a role in recklessly releasing chemicals into the air, placing residents and first responders at risk of serious bodily injury. The charge carries penalties of up to five years in prison for the two managers and a maximum $1 million fine for the company. 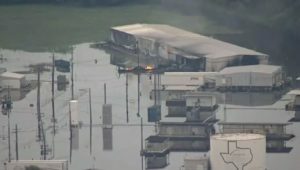 A U.S. Chemical Safety Board report said chemicals at the plant had to be kept frozen to avoid bursting into flames. But temperatures rose after floodwaters knocked out the plant’s main and back-up power. The chemicals exploded, causing a fire that burned for days, releasing the toxic chemical cloud. Prosecutors say the disaster could and should have been prevented. Arkema called the indictment “outrageous” in a statement, noting that the volume and duration of rain that fell in the area had a probability of occurring once every 5,000 to 20,000 years. “It is hard to believe anyone would seek to criminalize the way in which one facility was impacted by such a crushing natural disaster,” the statement said. Fifty inches of rain fell in some areas during Hurricane Harvey. The storm is responsible for 39 deaths. Over 200 people who lived near the Arkema plant had to be evacuated and couldn’t return to their homes for over a week due to the toxic chemical cloud. When this case is tossed out of court, which it should – Arkema should simply pack up the plant and move out of the state. The Environmental Crimes Division should remove every person in the division (backing this BS). Counter sue for attorney fees, loss of production and most of all “Defamation of Character”.